potentially nervous: this blog's story. as i keep fats close i'm going to keep him in this blog too, i sincerely hope that you allow his memory and his life to be one that always cheers you up. after all that's what those grueling modeling days of his were for. in turn it became about raising awareness about rabbits in general. so if there is one thing i'd love to ask of you, take a moment to check for cruelty free products before you buy your next cosmetic or lotion or shampoo....chances are there may be a bunny just like fats at the other end of one of those testings. let's take some steps to help them too. i have a list of cruelty free products on my blogroll list. i don't know how to make those gadgets really so here it is again. lastly but certainly not leastly, the other mission 'here' is visually but not really subliminally, advocating for the cageless bunny. although i did recently, i don't speak up about this too often but do so with the photos. we here at potentiallynervous also very muchly ; ) want to create a new image for rabbits... there are so many of us bunny owners who love our rabbits but who also can't even imagine a bunny not having a cage. let these guys be your inspiration and take a moment to picture fats in a cage. i bet you can't. please don't get mad at me for suggesting this....get creative! consider what it would take to bunny proof your house, if you need any helpful hints let me know and i will brainstorm with you until the cows and all the other animals come home. Excellent! All of it. I'm with you on blogging about things that make people smile...bunnies, horses, goats, dogs... baby clydsedales and longhorns..
Oh, I always come here for a smile! The first time I posted was to ask for a close-up of Nuage's leeps! And you were so obliging, what more can a bloggin' fool like me ask for? You've brought great joy into my life and I'll always be grateful for that. PS I think Fats paid me a visit. The night before last Ranger Dog came into the study and demanded that I play with him - this is unheard of - and for a full 10 minutes we chased each other around the house. When we got done he gave me this strange look and I immediately thought of Fats. I think he was saying, "Hello!". He just keeps on inspiring me. I'm so sorry to hear about Fats. But rest assured that my bf, bun (Tuz) and I love to visit your blog for a smile and a giggle. I can't wait until we live somewhere with a little space outside for Tuz. 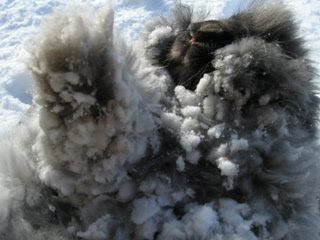 He would love the snow as much as Nuage! How could someone as cute & cuddly, furry & fluffy, lovable & hug-able and kissable and squish-able as Fats not bring a smile to your face and joy to your heart? Even when I was teary eyed I still had to smile and laugh. Fats Forever! If your goal is to make people smile, you've succeeded. Bunny pictures do make the world a happier place! Even though the loss is sad, seeing the pictures of them happy and well loved makes me happy and puts a smile on my face. Oh Alice, you can't know how successful you've been! Any time I need a smile I just hop over to PN, to watch Fats circle your feet or see Bells and Nuage frolic in the snow. Sometimes, I still go back to the videos of Fats in the barn with the cows, and laugh my tail off every time! A couple of days of grief certainly can't undo the years of lighthearted entertainment you've provided. Thank you. And thanks for continuing to post more Fats. I know how hard that must be for you, but I think we all really appreciate it. I second that, Lisa! Ditto ditto ditto! well said!! I agree with every word and even though some memories are sad they always bring a smile to my face because those precious seconds and minutes mean so very much! Arabella and Wesley love running around the house any time they want. Zai did that before them and Burns went everywhere with me, even to work! Here! Here! Cheers to cageless bunnies, cheers to cruelty free products, cheers to bunny photos that always bring us cheer even when there is sadness. I'm so sorry for your loss. Watching him has brought me so much happiness. Thank you for sharing him with us. We are so sorry for your loss. We loved Fats from along way off, but he was a very sweet and VERY smart bun! An inspiration t us all. Binkies to Fats joining my Bunny at the Bridge! I have wanted to write for a couple of days. Although I stumbled across your blog a couple of weeks ago, I only started to read it properly on Thursday, and on Thursday night as I read about Fats in bed, I was weeping. It took me a while to work out what was happening, before I realised that he has passed. I have only one bunny, Humphrey. And losing him is up there at the top of my fears. It helps, in advance, to know there are others who feel as deeply. I am frightened because my partner does not love Humphrey, even like him really, and has no understanding of how I feel. For now he is fine and I treasure every day with him. He is kind of late middle aged. Anyway, I will read your blog regularly now. And want to thank you for your frank, emotional posts.